Product prices and availability are accurate as of 2019-04-17 16:38:04 EDT and are subject to change. Any price and availability information displayed on http://www.amazon.com/ at the time of purchase will apply to the purchase of this product. 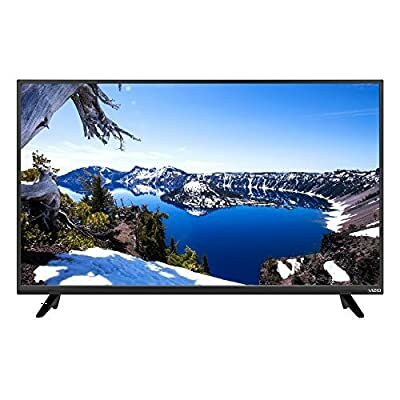 VIZIO D-Series Smart TV delivers your favorite HD entertainment with a brilliant picture at an incredible value. More than 2 Million screen pixels combine to form 1080p Full HD, producing an incredible level of radiance and crystal-clear detail. The VIZIO D-Series delivers stunning picture quality and clarity from innovative features that put greater beauty into every pixel. Full-Array LED backlighting delivers exceptional light uniformity and picture performance. VIZIO Internet Apps Plus gives you easy access to popular apps such as Netflix, XUMO, YouTube, and more. VIZIO Internet Apps Plus (V.I.A. Plus) and WiFi connectivity are built into every VIZIO D-Series Smart TV1. Enjoy a wide variety of popular apps with streaming content and internet radio at your fingertips. The simplified app home and app launcher make finding your favorite entertainment effortless. A revolutionary V6 Six-Core Processor featuring a quad-core GPU and dual-core CPU that speeds everything up - from finding content and apps to powering up the TV. With support for the Built-in Wi-Fi standard 802.11n, D-Series lets you stream from popular apps such as Netflix and YouTube. Browse content on your phone or tablet and play it directly to your VIZIO Smart TV. Enjoy true multi-screen viewing with Second Screen-ready mobile apps like Netflix and YouTube. HDMI and USB ports are perfect for connecting all your high definition entertainment devices to the TV. Advanced virtual surround sound audio from VIZIO's two built-in speakers. More energy efficient than conventional LCD TVs to save you even more on energy bills. Engineered with a simplified layout for ease-of-use without the button clutter.